Ramadan, the fasting month for Muslims, is here once again. Muslims in Malaysia began observing Ramadan on Saturday (Aug 22, 2009) and will do so for a month until the dawn of festivities known as Hari Raya here. 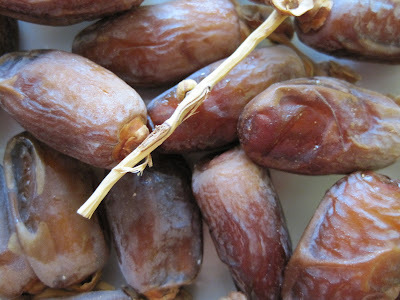 Ramadan is special for many reasons: savouring dates (as in the picture above) and traditional food, strengthening family ties and initiating gloomy and not-so-gloomy rounds of introspection. The last activity is particularly important because examining my own thoughts, feelings and motives will motivate me to improve myself when I understand my obligations as a human being on Earth. Prayers are important throughout the year but there is something about Ramadan that makes prayers even more meaningful. Performing specific additional prayers that aim to bring the faithful closer to God is highly encouraged. our thoughts are with you. stay calm!